Visit any BCBGMAXAZRIA store location in the U.S. or BCBGMAXAZRIA online and enjoy shopping during Memorial Day Sale 2016. You can save 40% off all footwear & accessories. 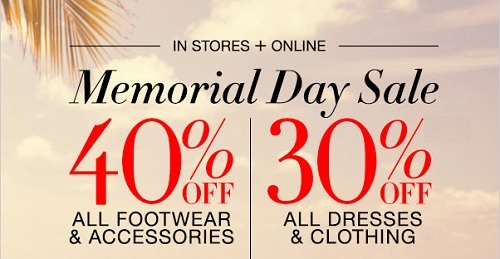 You can also save 30% off all dresses & clothing. Source of the information is BCBGMAXAZRIA. Offer is valid until Monday, May 30, 2016. For more details visit any BCBGMAXAZRIA store or official website.